This terrace is one of the most unusual and distinctive in Dunedin. Its balconies with bullnose verandahs and lashings of decorative cast iron fretwork would look quite at home in Melbourne but are almost exotic here. 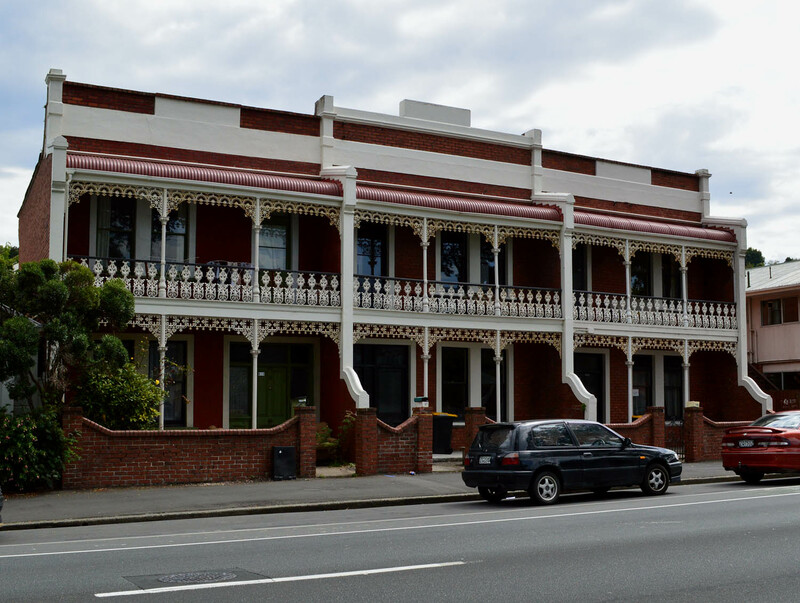 Terraces featured significantly in Dunedin’s early housing and more than twenty rows still stand from their heyday period of 1876-1912, not including terrace-like pairs of semi-detached houses. There were once many more. The simplest ones were working-class tenements but the fancier ones were marketed to white collar workers and professionals. They were a good investment option for early landlords, particularly before electric tram services opened up the suburbs, and with land in the industrialised central city at a premium. I’ve titled this post ‘Gleeson’s Terrace’ because these houses were built for William Gleeson, but as far as I know this was not a name used historically. Gleeson (1841-1917) was the proprietor of the Rainbow Hotel in George Street and in 1902 he also owned the Annandale Arms, a two-storeyed wooden hotel which stood on the site of the terrace. The Annandale Arms was refused a license in June that year and the old building was soon torn down. In October tenders were called for the erection of the terrace. In addition to the three two-storeyed ‘villas’ at the front of the property, a row of four single-storey dwellings was built at the rear. These survive but cannot be seen from the street and are only accessible via a private right-of-way (so I haven’t included photographs of them). After the terrace was built the next-door neighbour on the southern side sued Gleeson, as the building encroached onto her land and it was claimed that water swept from its roof onto hers. She was awarded some damages and it was ordered that decorative features at the top of the building that projected over her property be removed. Detail from an early photograph, showing the parapet as it appeared c.1910, with balustrading and finials. Te Papa Co.025249. The builders were Peter Campbell and/or Henry Foster. The architect was Percy Laing, whose signature can be seen on the deposited plans on file at the Dunedin City Council. Laing was a Dunedin boy who went to Otago Boys’ High School and was trained by that pre-eminent Dunedin architect, R.A. Lawson. He afterwards went to Melbourne where he was employed by N. Billing & Son. After returning to Dunedin he worked with Robert Forrest before establishing his own practice in 1903, the year this terrace was built. Laing died in a climbing accident near Ben Lomond saddle in 1915, at the age of 56. His other designs include Ramsay Lodge at 60 Stafford Street and the Kensington Hotel (later remodelled in art deco style). This terrace is a little old-fashioned looking for 1903 and could easily be mistaken for an earlier building, although the front walls and fire walls perhaps give it away as later. It is derived from a style popular in Australia in the 1880s and the architect’s time working in Melbourne largely explains the connection, although it would be interesting to know what his client’s instructions were. The deposited plans differ from the finished building in that they show a balustraded parapet with finials. They also show a cornice that was probably built and later removed. The plans don’t show the iron lacework as it appears. This was produced very nearby at Barningham & Co.’s Victoria Foundry in George Street (opposite Knox Church), and possibly chosen straight from their catalogue. The company’s name can be seen at the base of the verandah posts. 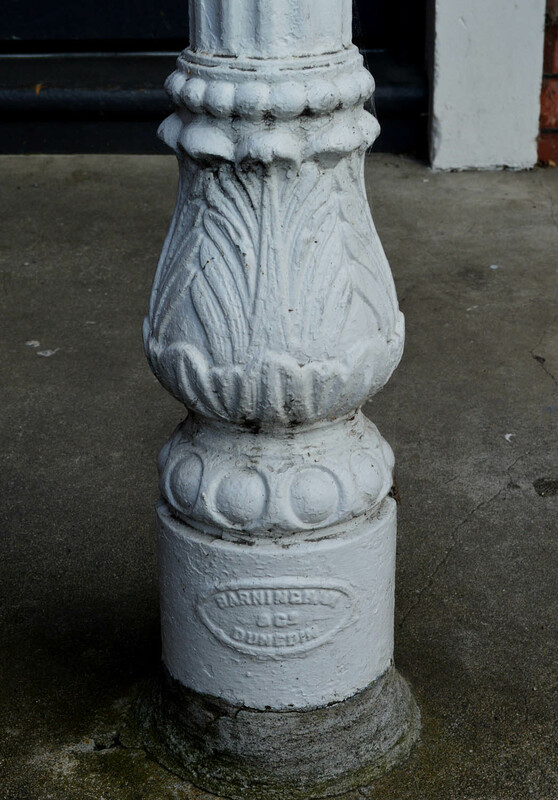 Barningham’s were well-known for manufacturing the ‘Zealandia’ brand of coal ranges and their 1903 advertisements referred to ‘verandah castings of all kinds’. 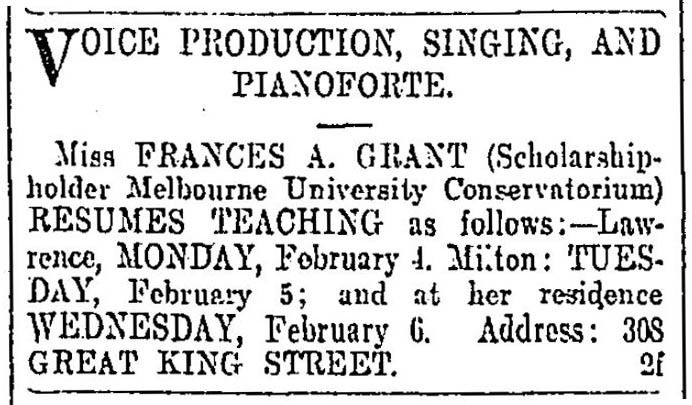 The first resident of the southernmost house (then number 308) was Frances Grant, who taught singing and piano. The other two houses were occupied by painter/decorators. Two of the three houses were soon converted to flats (upstairs and downstairs), and for this reason new front doors were installed. Few tenants stayed long and occupants included a butcher, a draper, engineers, a brewer, a grocer, a police sergeant, a railway guard, and a barman. Special mention should be made of the Lindsay family. Robert and Sara Lindsay’s family moved into the southernmost house around 1928. Robert was a blacksmith. Annie Lindsay remained there until her death at the age of 97 in 2007, when the house was still in very original condition, retaining its kauri fireplace surrounds with tile insets. The houses now appear to be used as student accommodation, being handy to the university. Otago Daily Times, 4 February 1907 p.6. The street numbers were changed in 1910 and 308 corresponds with the present 618. The terrace looked pretty rough in 2009 but by 2010 a lot of love, money, and expertise had obviously gone into renovations and restoration. 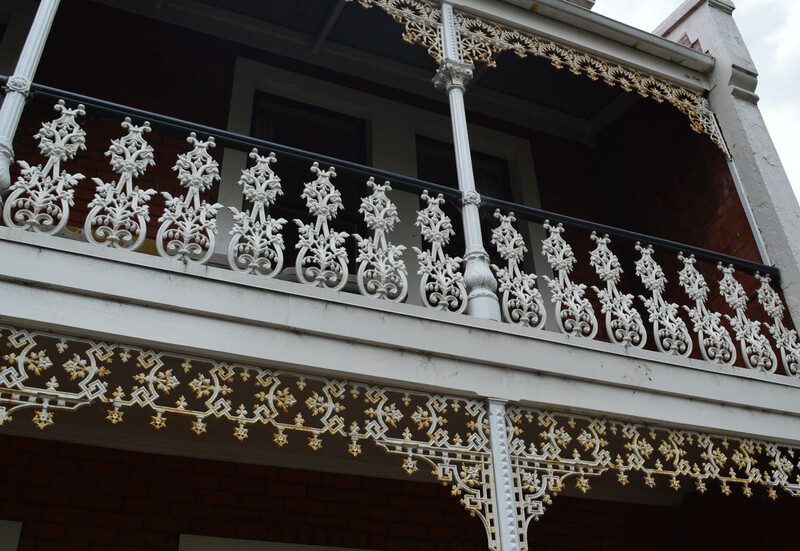 The balcony no longer slumps and mismatching timber railings put in over the years have been removed and replaced with replicas of the original ironwork. The result is impressive. Newspaper references: Otago Daily Times, 2 June 1903 p.4 (license refused to Annandale Arms), 27 October 1903 p.6 (call for tenders), 4 December 1903 p.7 (Gleeson fined re drainage), 5 August 1905 p.3 (legal dispute re land), 4 February 1907 p.6 (advertisement for Frances Grant); 6 April 1915 p.3 (death of Percy Laing), 28 April 2007 (advertisement in property supplement); New Zealand Tablet, 1 October 1903 p.32 (Barningham advertisement). Other references: Dunedin City Council deposited plans, Stone’s Otago and Southland Directory, Wise’s New Zealand Post Office Directory. This entry was posted in Buildings and tagged 1900s, Barningham & Co., Decorative ironwork, Edwardian, Great King Street, Henry Charles Foster, Houses, Percy Laing, Peter Campbell, Terraces on 10 February 2013 by David Murray.